San Diego Food Blogs List. The Best San Diego Food Blogs from thousands of San Diego Food blogs in our index using search and social metrics. We’ve carefully selected these websites because they are actively working to educate, inspire, and empower their readers with frequent updates and high-quality information. 2.13 Menu In Progress | Savory before sweet. Tasty before neat. San Diego Food newsletter is a comprehensive summary of the day's most important blog posts and news articles from the best San Diego Food websites on the web, and delivered to your email inbox each morning. To subscribe, simply provide us with your email address. San Diego, CA About Blog The San Diego Restaurant, Bar, and Nightlife Blog. Food news and dining guides for San Diego. Facebook fans 31,891. Twitter followers 11,592. San Diego About Blog Nationally published and award-winning author, food writer and photographer Maria Desiderata Montana takes you on a food journey throughout San Diego and beyond. Montana is the publisher of the San Diego Food Finds BLOG and the new book San Diego Food Finds Best Local Eats: (2017, 2018), which is updated yearly. Facebook fans 12,283. Twitter followers n/a. San Francisco, CA About Blog Dedicated towards showcasing food from all over the San Diego area - especially our local border cuisine (INCLUDING TIJUANA). Facebook fans 1,187,094. Twitter followers 555,425. San Diego, CA About Blog Edible San Diego tells the story of San Diego County's diverse regional food system. We are your resource for authentic local experiences, products, and stories from the growers, fishers, retailers, chefs, and food artisans in your neighborhoods. Facebook fans 14,779. Twitter followers 8,581. All over San Diego! About Blog Bite San Diego food tours was started in 2010 by a perky native who loves finding the best restaurants in San Diego and eating really good food. Bite San Diego features the best walking tours in San Diego, which help locals and visitors alike explore the growing food scene in America’s Finest City via guided walking food tours. Go inside San Diego’s exceptional restaurants and sample the cuisine making San Diego something to BITE about. Facebook fans 3,957. Twitter followers 2,513. San Diego, CA About Blog SanDiegoFood.net was born as the creation of 2 cousins (Michael & Darren), Michael’s wife (Jorgina), and a community of foodies searching for the best food San Diego has to offer. Facebook fans 468. Twitter followers 3,791. San Diego About Blog Kirbie’s Cravings is a food blog based in San Diego sharing recipes (ranging from healthy meals to easy desserts) and dining out experiences (in San Diego and from our travels). Kirbie is a author of two cookbooks 5-Minute Mug Cakes and Dump Cakes from Scratch. Facebook fans 10,380. Twitter followers 2,562. San Diego, CA About Blog To Market, To Market... With San Diego Foodstuff is San Diego food writer Caron Golden's forum for discussing great food in San Diego and beyond -- from ethnic markets, artisan bakeries, and specialty gourmet shops to farmers markets, specialty producers, and more. Okay, restaurants, too! Facebook fans 2,187. Twitter followers 3,799. San Diego, CA About Blog A sarcastic food blogger here in beautiful San Diego. I write about food (coupled with real stories) simply because it makes me happy. San Diego, CA About Blog I'm a San Diego foodie who loves to share my passion for good food and drinks on social media, and thus SanDiegoFoodGirl.com was born. Striving to showcase all the best from fish tacos to Bloody Marys and everything in between. Come along, join the fun, and enjoy a taste of Southern California! Facebook fans 225. Twitter followers 422. San Diego, CA About Blog A half Japanese food and wine reviewer residing in San Diego. Frances reviews everything from high-end restaurants to wines to snacks. Facebook fans 608. Twitter followers 2,047. San Diego, CA About Blog San Diego food blog covering restaurant reviews, recipes, travel and more. Om nom nom! 13. Menu In Progress | Savory before sweet. Tasty before neat. San Diego About Blog We are Mike and Sherry and we're located in San Diego (Pacific Beach, to be more precise). We are avid consumers and producers of food and beverages. This blog gives us a place to share our culinary adventures with family, friends and anyone else who stops by. San Diego, CA About Blog Official website for "Classic San Diego," a book about the history of San Diego and Tijuana's classic restaurants, bars and hotels. Facebook fans 245. Twitter followers 22. San Diego About Blog As in, yoso-silly, yoso-hungry, yoso-full, or best of all; mmm-delici-yoso!!!!! An Ex-Pat Kama'aina and Friends explore food in San Diego and points beyond. 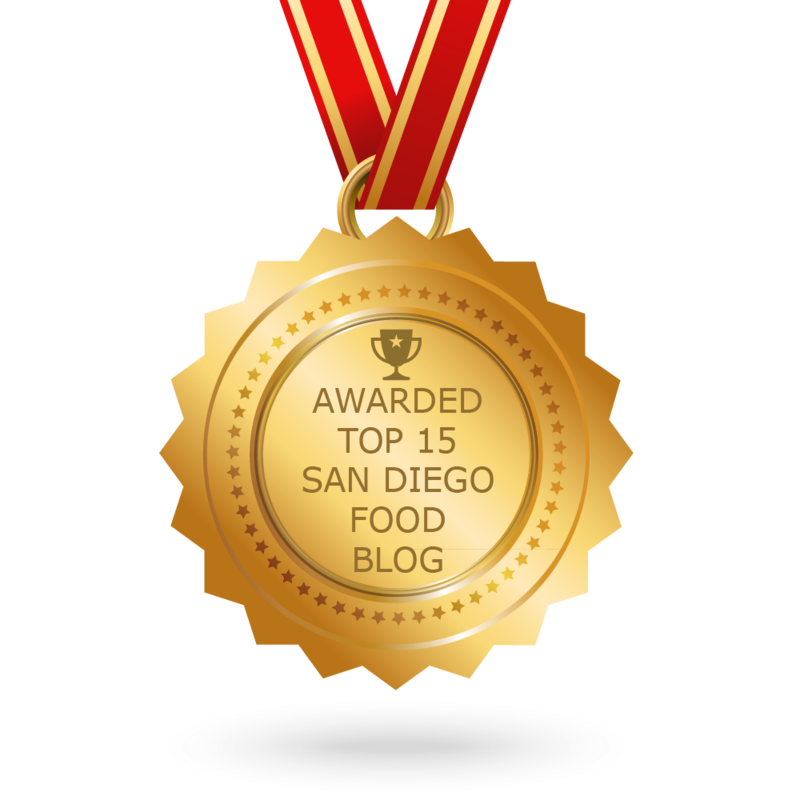 CONGRATULATIONS to every blogger that has made this Top San Diego Food Blogs list! This is the most comprehensive list of best San Diego Food blogs on the internet and I’m honoured to have you as part of this! I personally give you a high-five and want to thank you for your contribution to this world.